Maybe you’re leaving to travel for a year. Maybe you’re downsizing apartments. Maybe you just have too much clutter and don’t want to give any of it up just yet. Whatever the reason, having the option for self-storage is always helpful. 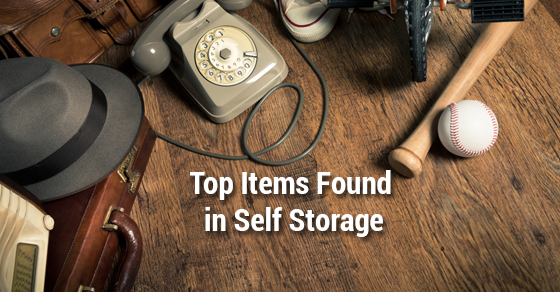 What types of items are found most often in self-storage units? Here are the top four, along with tips on how to store them! Though you may not be using them right now, electronics are often valuable and worth holding onto for the future. Electronics can be difficult to store, as they are very sensitive to moisture and water damage, and to climate. Electronics should always be stored in a dry, climate-controlled environment. Cords and other miscellaneous pieces can become easily misplaced or mixed up. Detach any cords from your electronics, and carefully label and organize anything. You’ll thank yourself later! Because electronics are so susceptible to water damage, take care to wrap them in blankets, towels, or sheets, rather than plastic. Plastic doesn’t breathe and will only create a humid environment if any water gets in. Often businesses must hold onto paperwork for a specific period of time. This can lead to lots of space being taken up by paper! When storing paperwork, climate-control is very important, as humidity can cause mildew or other moisture-related damage. Plastic, airtight containers are ideal for keeping mildew out. Make sure files are impeccably organized and can be easily referenced. Additionally, make sure the facility provides excellent security. Use safes and combination locks whenever needed. Furniture is often stored during a move, if someone is downsizing living space, or if someone has gone away for a long period of time. Different materials prevent different storage challenges. Extra care should be taken with fragile items like mirrors, lamps, or anything made of glass. Lampshades should be removed and lamps wrapped in cushioning material. Placing a masking tape X on the surface of glass or mirrors will alert staff to be extra careful with it. With wood or fabric, mildew and rodent damage can be an issue. Use wood finish to protect wood, and thoroughly clean fabric furniture to prevent mould or mildew. Mildew is caused by humidity in the air, so make sure your storage unit is climate-controlled. Rodents can also eat through wood. If this is a concern, try a rodent repellent in your storage unit. Art and antiques are often of high value, monetary or sentimental, and require utmost care in their storage. When storing art or antique items, choose a storage property that has experience with such items. The property should offer excellent security, and a climate-controlled environment. If you are unsure about how to store a specific piece or artwork, consult an expert. Depending on the type of art, storage needs can differ. It is of course important to ensure everything is kept dry, cushioned, and handled with care. If a piece of art or an antique is particularly high in value, be sure to have it appraised and/or insured before placing it in storage. To talk to an expert, contact us today!